Dr. Gary McCaleb (’64), vice president of the university, aptly describes Friday Praise Day Chapel in Moody Coliseum as a favorite time of each week for ACU students. Dr. Gary McCaleb was Sing Song director from 1964-72. “It’s a favorite because we primarily sing the entire time,” he said. “We love to sing!” And that, he said, is one of the contributing factors to the continuing success of ACU Sing Song. McCaleb can remember watching Sing Song in Sewell Auditorium as a young man. The auditorium seating was divided into three sections – a large center section with two aisles on either side and sections flanking those aisles. When Sing Song was in Sewell, he said the student groups who performed sat in the side sections while the audience members sat in the center section. One group would perform, then return to their seats while another group moved from the floor to the stage. In the late 1950s, the timing was right for Sing Song. “Our heritage with a cappella music and the fact that we were called “The Singing College” made Sing Song a natural fit,” he said. 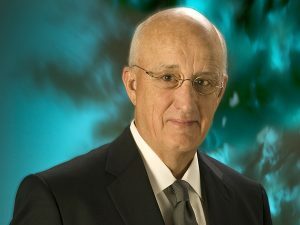 Dr. Gary McCaleb’s administrative career at ACU has now spanned 51 years. “We couldn’t quit singing,” he added with a chuckle. During the transitions of one group returning to their seats while another moved on stage, students in the audience would conspire to start some sort of a creative ditty – and another – and another. Spontaneous eruptions of song were the norm. With the night full of songs from the stage and more from the floor, McCaleb described one major obstacle with Sing Song in Sewell: The size of the auditorium was woefully small. To help remedy that situation, Sing Song relocated to Abilene High School’s larger auditorium in 1962. 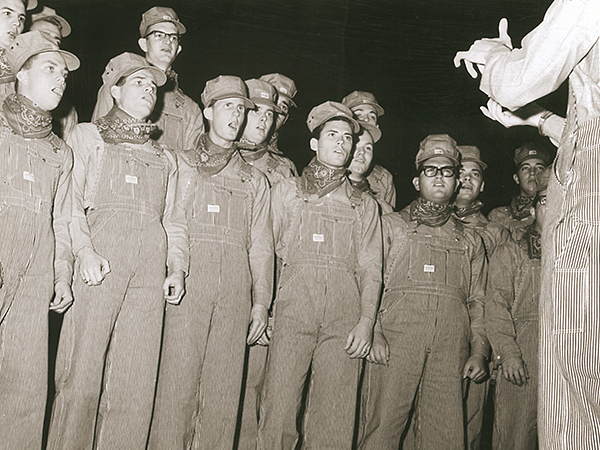 In 1964, McCaleb went from being a student to joining the ACU staff, with Sing Song as one of his responsibilities. 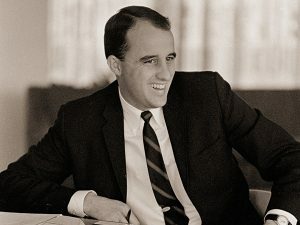 The 1964 show was the first of nine he directed, making him one of the longest-tenured Sing Song directors in history. “Every time the show made a physical transformation, it seemed to take a natural turn with new developments,” he said. 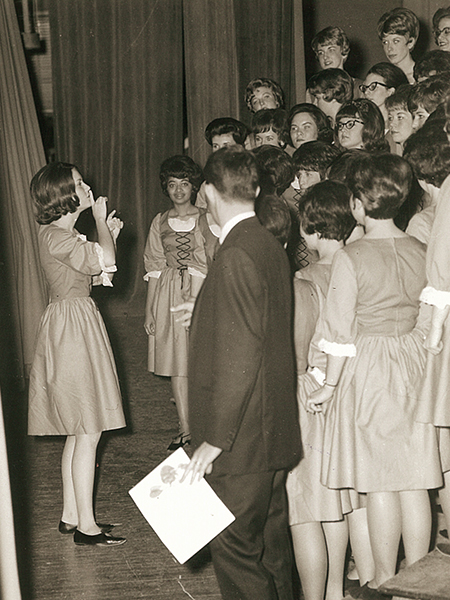 In the Abilene High auditorium, the student groups sat in the balcony, and starting rounds of songs as they did in the more intimate Sewell Auditorium didn’t work as well. So the student host and hostess who served as emcees started the ditties, and soon the ditties became songs, and the modern concept of host and hostess emerged. “Before too long, the host and hostess were singing with a drummer, a bass and a piano on stage,” he explained. That was 1967. Student participation had grown to about 800 students at that time. By 1968, more change was in the air. A new modern structure was being built on campus: Moody Coliseum. 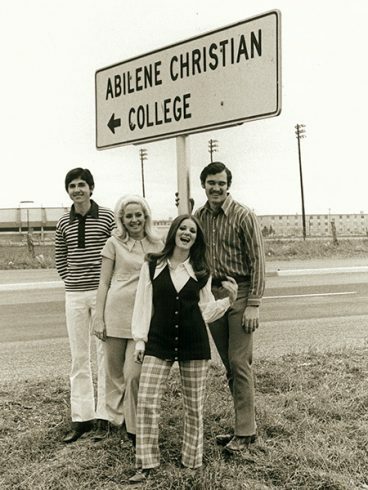 The last Sing Song at Abilene High took place in 1968, and the show moved back to campus in 1969. “They started with ‘We-e-e-e’re off to see the wizard!’” McCaleb said. “They held out that ‘we’re’ and when they hit the word ‘off,’ they started swinging their arms and marching in place, and the audience went wild!” For the first time, a Sing Song group integrated choreography with singing. “They put on roller skates, and skated and sang across the stage with follow spotlights,” McCaleb said. “Then, they got down on the floor and skated through the audience singing. The crowd loved it.” Again, audience reaction raised the bar for future students to be even more creative. “In memorable moments like that you could actually see the course of Sing Song changing,” McCaleb said. 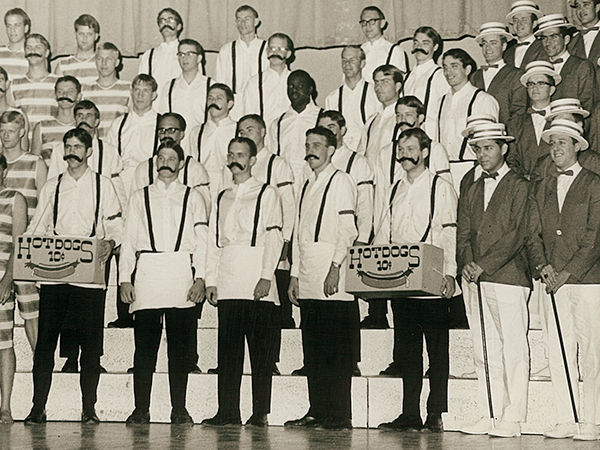 Men’s club Phi Delta Psi performed “Casey Jones” at Sing Song 1965. 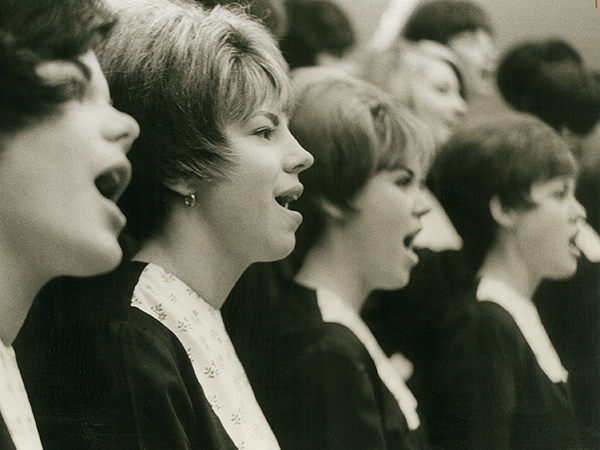 Women’s club Zeta Rho prepares backstage to perform in Sing Song 1966. Men’s club Knights performed “Coney Island Baby” at Sing Song 1968.